Kameron Bink was born and raised in South Florida and started his Training at the Age of 6. He started working professionally at the age of 16 dancing in Miami with artists such as Paulina Rubio, Ivy Queen, Don Omar and Celia Cruz. In 2007 Kameron was a Top 10 Finalist on Foxʼs “So You Think You Can Dance”. Since then Kameron has had the opportunity to teach all over the world in countries such as Australia, South Africa, Germany, Spain, Iceland, Italy, Singapore and Switzerland. In 2009 he had the opportunity to back to his true passion, performing, dancing in the company Bad Boys of Dance in Rasta Thomas’ “Rock The Ballet” and has been on 3 World Tours with the company and has performed in 23 countries. 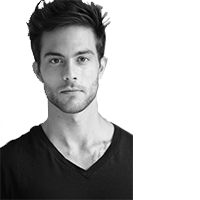 Kameron also had the opportunity to work under renowned Contemporary Choreographer Larry Keigwin and Premiered his piece “Runaway” at the Joyce Theatre in New York City in the Spring of 2011. For the last 2 years Kameron has been dancing in Iceland as a teacher and guest of The Icelandic Dance Company. Kameron is currently living in South Florida where he continues his education in Dance and hopes to continue moving and bringing joy to audiences and inspire young dancers all over the world.